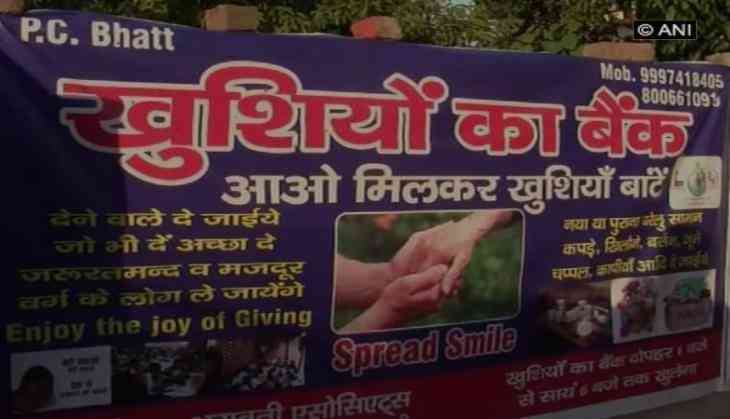 Money can't buy you love, but there is now a bank in Uttarakhand that trades in good deeds. A Haldwani resident has been catering to the poor through a unique initiative - 'Bank of Happiness', which provides basic necessities, free of cost, to those who need them the most. Here, the residents of the city can donate their clothes, shoes, utensils and bedding, and those in need can come and take away items of their choice. Praveen Bhatt, who began this initiative last year on November 21, told ANI, "The aim behind setting up this bank was to ensure our poor brethren, including labourers, live comfortably and receive basic necessities free of cost. We have got great support from people, we have received donations from Dehradun and even Delhi". The bank has also provided coolers and refrigerator to the needy, through donations, Bhatt informed, adding, "We are also thinking of expanding towards educations. Many children are not going to school so we are thinking of providing them free stationery." In the early hours of Friday, scores of people were seen thronging to the bank and sifting through the clothes and shoes. Some residents also came to donate who had only words of praise for the humanitarian step. "This is commendable, and it can become even better if members of the society contribute. Many want to but don't have a platform. Now they too can give their bit," Vimala Pandey, one of the donors said.